The Day 1 of Lakme Fashion Week 2013 saw a rush of celebrities not only walking the ramp but also attending and hooting for their favorite designers, reports Véronique Polès. 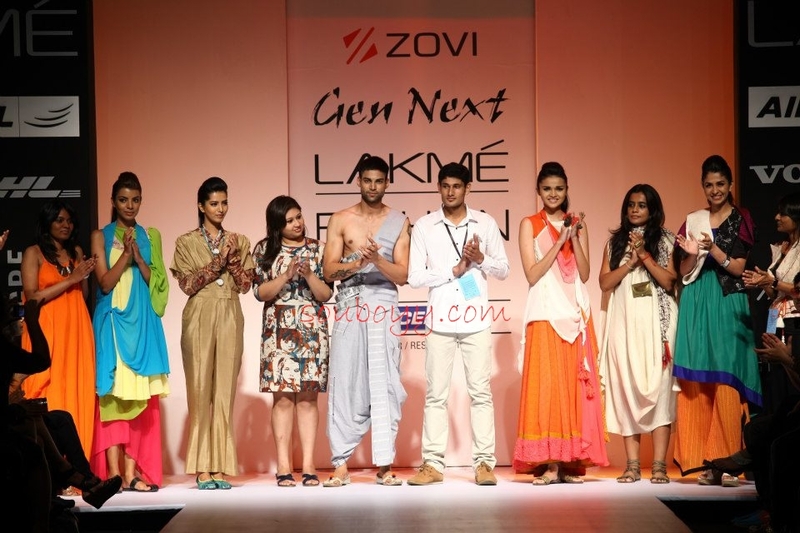 The Lakme Fashion Week (LFW) summer-resort 2013 kickstarted in Mumbai on Friday with six budding designers showcasing their modern creations at the Gen Next show. The fashion lines showcased were designed by Debashri Samanta, Karishma Jamwal, Ragini Ahuja, Shubham Kumar, Sneha S. Saha and Stephany D’Souza. The unity of the youth in raising their voice against recent unfortunate incidents in the country inspired fashion designer Narendra Kumar. He brought alive the Thought Police, with models walking down a ramp, guarded by men dressed as soldiers. Fashion designer Arpan Vohra took inspiration from the 1960s for his vintage collection with a modern twist. The collection, loaded with metallic colours, was titled “Lights, camera, fashion”. Actress Parineeti Chopra displayed her usual joyous self while walking the ramp for designer Masaba at the Lakme Fashion Week Summer-Resort 2013. The actress looked stunning in a long white jacket with black Masaba signature print and a bright hot pink ‘dhoti’ teamed with stylish gold jewellery. She looked neat in her tied hair. The collection was called ‘Postcards of Banaras’. “My collection is an ode to the widows of Benaras. It is interesting and I saw that no one has picked up this idea before. My collection had predominantly white in it,” Masaba said. The designer also used a lot of gold Benarasi jewellery — a highlight of the evening. Day 1 came to an end with ace designer Manish Malhotra dedicating his line to 100 years of Indian cinema. The show started with four renowned filmmakers of ‘Bombay Talkies’ – Karan Johar, Anurag Kashyap, Dibakar Banerjee and Zoya Akhtar – walking the ramp. All four were dressed in black. Malhotra’s collection was inspired by the three main eras of fashion in Indian cinema — from 1913 to 2013 — and was a homage to the distinctive styles of every iconic period in Indian cinema. The designs started off from the black and white era and had a collection of lehengas and kurtas. After this came the colour era with bright colours like pink, green and yellow. The clothes had detailed embroidery work on them as well. This was followed by a vibrant range of patterns like polka dotted clothes which was later followed more modern apparel. The show was indeed a star-studded experience with celebrities like Priyanka Chopra, Sidharth Malhotra and Varun Dhawan walking the ramp. While Priyanka donned a vibrant green sari with a hot pink border, Varun Dhawan looked dapper in a white kurta Pajama with a stunning blue jacket. 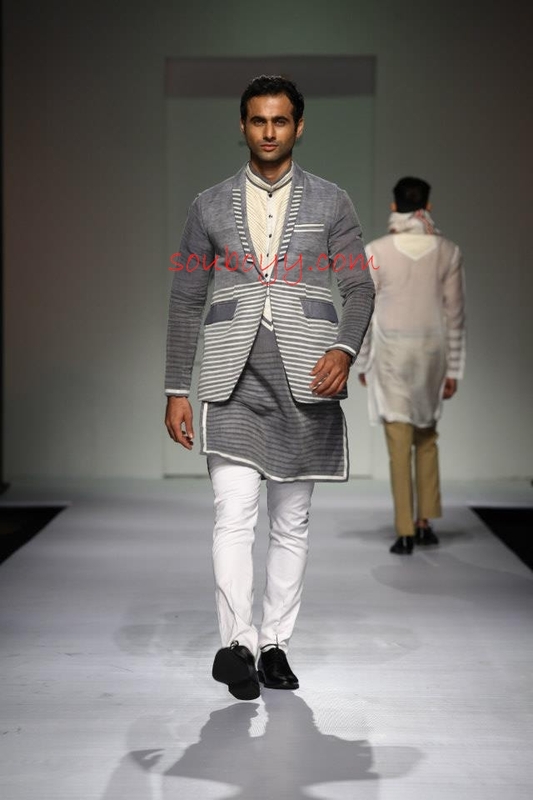 Sidharth who was welcomed with whistles pulled off a pink jacket over white kurta pajama with elan. Priyanka also called on to the ramp three legends from different fields; actress Hema Malini, singer Asha Bhosle and designer Bhanu Athiya. All three were dressed in Manish Malhotra outfits. The designer who has designed many outfits for Kajol and Karishma for their films also invited them to walk the ramp with him. I would love to read your post, but I couldn’t cause of your background.